Apparently Karl Hyde and Brian Eno needed to record a full album together before they could get really get warmed up. The pair’s May 2014 release Someday World was pleasant enough but felt like the two songwriters involved were still feeling each other out, unsure about how to completely commit to this creative process. There’s nothing of that sensation on High Life. The six-track album (seven if you buy the digital, eight if you pony up for the vinyl edition coming out in August) has the internal warmth and jubilant spirit that its predecessor was lacking, with the music appearing to blossom before you rather than clacking by like a train. This feeling stems from the playfulness of these sessions. Hyde apparently opened up his guitar parts to Eno’s audio processes, even while he was playing them. You can catch little hints of that throughout: These small loops of melody, or a chord progression captured, manipulated and then returned into the middle of the song. It gives the album a perfectly psychedelic feel without resorting to the paisley-printed signifiers associated with that genre. The two extend this approach even to their own vocals, pitching them up into the female vocal range on “Cells and Bells” and “Time To Waste It.” It adds a ticklish bit of fun to the already pleasurable mix. The two allow themselves the room to play in a number of different musical styles. Eno returns to the rich, polyrhythmic sound of Afrobeat that infected his work with Talking Heads on the propulsive instrumental “DBF.” They follow that with “Time,” a sly bit of Meters-style deep funk, undercut with some dub reggae touches. “Moulded Life” harkens back to some of Hyde’s early work with Underworld, via some drill bit rhythms and bass lines that feel covered in moss. Closer “Cells” extends out Eno’s ambient efforts to a lava-flow pace over which little guitar and synth signatures dance and sparkle. 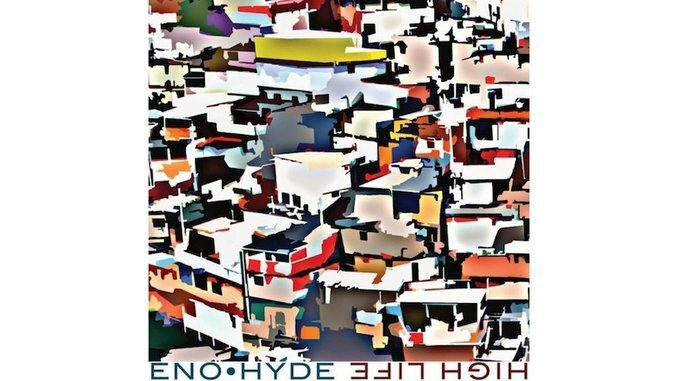 Perhaps the most impressive result of Eno Hyde’s efforts is not that it washes away the bitter taste left by Someday World, but that it should inspire you to revisit that first collaboration. Maybe there are depths and subtleties missed the first time around? If not, at least it reverses the sensation of album No. 1, which is to now hope that these two find time to work together again.